As a 25-year veteran of the food business, Christopher Kline has plenty of experience opening restaurants. 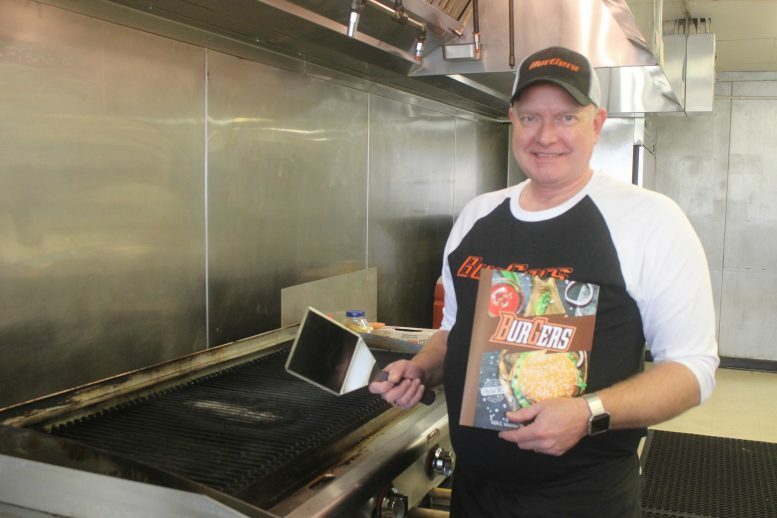 He’s welcomed customers to new eateries during a career working for Texas Roadhouse, The Cheesecake Factory, J. Alexander’s and Pizza Papalis. Now he’s opened his 10th place, and this one is his. Kline and his business partner and wife, Lisa, have opened BurGers – pronounced BG Burgers – at 1424 E. Wooster St., Bowling Green. TGhe restaurant started serving on Friday (Dec. 14, 2018). They’ve taken over the name of the previous tenant and the kitchen equipment, that’s been closed now for two months. But the approach is all new. Kline has wanted to open his own place for some time. With his work experience and education – a culinary degree from Johnson & Wales as well as a masters degree in business – he’d been dreaming of a steakhouse. But his hometown of Napoleon didn’t fit with that. His wife, who is the finance manager at BG Lincoln Mercury had other ideas. The location, right across the street from campus, is ideal, he said. That simple menu doesn’t mean he’s dumbed down his approach. From the quality of beef and cheese – purchased from Belleville Brothers Market as proudly announced on the menu – to buns sturdy enough to support a juicy half-pound burger to the quality of the cleaning products, Kline is tuned into the fine details of the operation. He selected steak fries to buy so they will survive delivery across town, a service BurGers will offer starting in January. Yes, opening a restaurant does get easier with experience, he said. He knows what the Health Department expects. He knows about training. He knows what to worry about and what not to. He kept the name, he said, rather than spend money on rebranding. He’d rather be spending time making all the dressings in house, including a signature honey creme mustard, that’s actually his wife’s recipe. The dressing uses a mustard that won top honors in a Napa Valley contest. From across the room, she hollers to him not to reveal any more details. There’s plenty more he can talk about. Like The Cheesecake Factory cheesecake that the restaurant sells, four varieties including the popular white chocolate raspberry. And the “real” Cuban sandwich with slow roasted pork and ham. And then there’s prettles, and old world breakfast pork product that’s a key feature of the Hangover burger. The namesake burgers come in third and half pound servings. Kline likes the larger size since it can be cooked even well done without drying out. Those burgers can be served with a variety of sauces, cheeses, bread – gluten free or even lettuce instead – and toppings. The choices are not overwhelming. He wants his cooks to concentrate on quality, not having to juggle a huge variety of ingredients. The menu has four paninis with combinations of chicken, smoked turkey, ham, pastrami, and bacon as well as cheeses. In a way all this got started with a tomato rose. As a kid growing up in Napoleon, he loved watching “The Chefs of Chicago” on public television. At 11, he was already cooking for himself. One day they showed how to cut a tomato into the shape of a rose. He went to the kitchen and did it. His tomato rose looked just as good as the one on TV. In high school he attended Four County Career Center in Archbold, and studied food service. Now he’s putting that energy, and everything he’s learned into this new venture. To start BurGers will be open 11 a.a.m to 11 p.m. Monday through Saturday, and 11 a.m. to 10 p.m. on Sundays. He expects to expand those hours once delivery starts. BurGers (Bg-Burgers.com) can be reached at 419-352-3663.